TOP POWER® – Mountain Power, Inc. Looking for a dependable, quality battery at an affordable price? The TOP POWER battery from HAWKER delivers the power you need at the value you want. The TOP POWER battery serves as an efficient, affordable energy source for use in a variety of plant / warehouse environments. TOP POWER is produced in the most modern, environmentally-friendly, and quality-driven plant in the industry. At every step in production, we use the best processes and materials to achieve one goal – Quality Products. Take for example our “signature system”. Whether it’s the stripe Melvin Sanchez paints on the grids he casts, or the initials Earl Thompson stamps into the posts he burns – each and every person who helps build a HAWKER battery places his or her mark of quality on it. The National Standards Association of Ireland (NSAI) has also placed its mark of quality – ISO 9001:2008 Certification – on our manufacturing process. 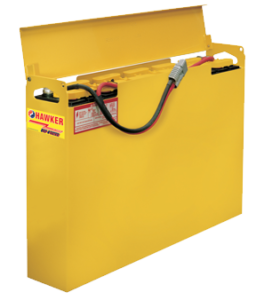 TOP POWER batteries are the ideal choice for less demanding environments. This workhorse will keep your pallet jacks and lift trucks up and running for a full 1,500 cycles. How you ask? It’s all in the battery’s design and construction. Multi-Layer Retention System – Includes the vertical wrap, koroseal jacket, and all encased in a bottom boot. Wrapped plates are then sleeved in a high-quality microporous plastic material. TOP POWER is the ideal battery for trucks that do not use attachments or trucks that do not operate in harsh conditions. TOP POWER is clearly the affordable and quality power solution. TOP POWER will keep your equipment running at peak levels – without running over budget. 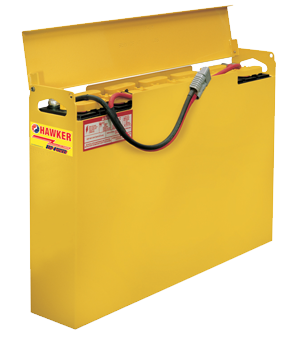 HAWKER's tough, thick grid construction reduces corrosion and generates cooler battery operating temperatures – both leading to increased battery life. HAWKER's dense pasted plate ensures long-life operation under deep cycling as well as continued, uninterrupted power. Being subjected to significantly lower temperatures during formation results in more power and longer battery life.